Voting is a vital civic duty. This is especially true during municipal elections, which differ from provincial or national elections in that people have a localized voice, and vote directly to elect individuals who become city councillors. Your city councillor is your direct channel to the local government, who then advocates and fights for the concerns and needs of your community. Vote if you care about the quality and future of local schools, the education our children receive; if you care about fair labour, efficient urban transit, fair taxation, facilities, or efficient services — you have a reason to cast a ballot this election. For the City of Toronto, advance polls start on October 10 from 10 am to 7 pm each day and ends on October 14. You can find the advance voting locations in your ward on your voting card or the MyVote site – or you can cast a ballot at City Hall. We encourage members to participate in advance polls to amplify the impact of your vote. The most critical component of casting a ballot is making an informed decision. 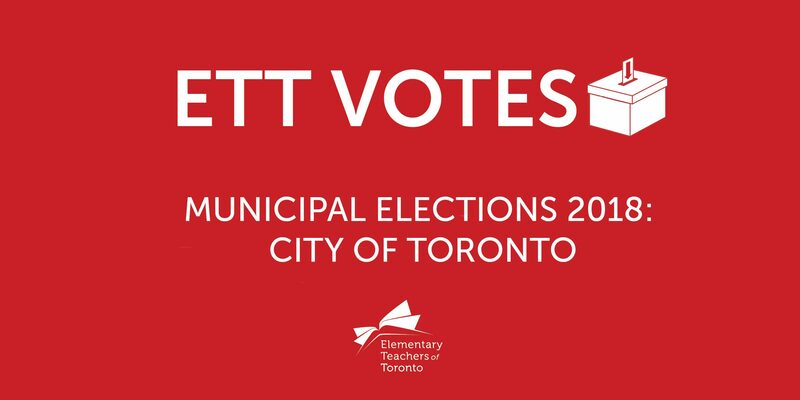 Visit the links or download the files below to learn about candidates supported by ETT and endorsed by the Toronto York Region Labour Council. Election day is on October 22. Jennifer Keesmaat – watch Jennifer Keesmaat’s message for ETT. The Councillor Candidate Spotlight Series will add new updates from now until election day.